I don't like playing favorites, as was recently covered, if not ad nauseum, ad feeling slightly off-eum. Even so, sometimes one has to make a choice. Much as I would love to keep a wealth of tea varieties in my office at work, I'm already inundated with stuff - particularly file folders, which I cannot seem to conquer. Also, though I have tea strainers/filters at work, it's not always time-effective to go through the preferred process, so I save it for special occasions (like a particularly quiet day, which is rare.) In the long run, I decided to settle on picking a good, sturdy, easy-to-prepare, yet tasty teabag. This tea would have to be a breakfast tea, as it needs to have that workaday quality to combat my stupid craving for coffee that creeps up on me - especially when I smell it brewing (even from a k cup). A hearty black tea that could handle a bit of milk is just the thing, though I should be able to leave the milk out without hating it. I've tried PG Tips, Typhoo, Twinings, Yorkshire Gold, and let's not get into the brief flirtation with Lipton. Besides the latter mistake, all of these teas were good . Obviously I prefer British brands. (By the way, Yorkshire Gold is the runner up. I have not problem with it; it's just mildly pricier over here.) Then on my last trip to London - the place I start to crave as the warm weather wanes - I noticed which tea gave me the most pleasure in the mornings. Even more than Afternoon Teas and Cream Teas, on this visit I had a bunch of Full English Breakfasts, or Nearly Full, because no 'puddings' or tomatoes for me. 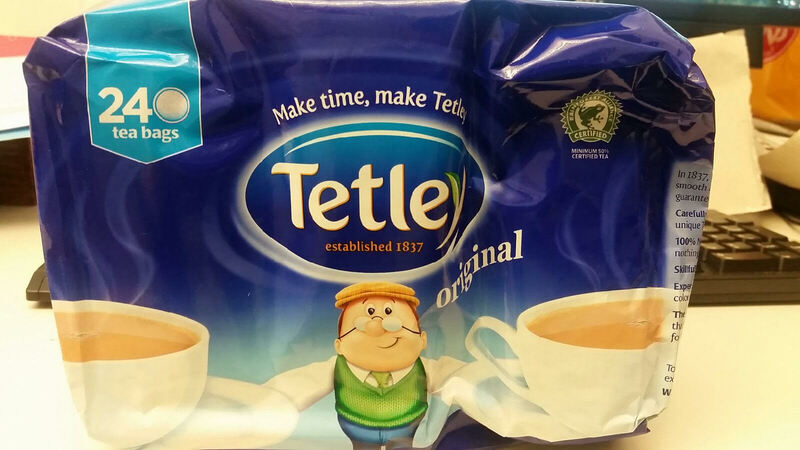 Anyway, whether I was having buttered toast or a fryup, it was Tetley that made me feel both cozy and ready to go on with my day the most. Rainy days were made better by that mugful of love. Normally I pick up tea from Whittard or somewhere similarly fun, and I'll probably do that next time. In London 2014, however, I went to the local Sainsbury's and bought a delightfully inexpensive package of Tetley, containing 80 bags - and a decaf one for those days when I shouldn't be further pepped up. These teas gave me comfort through the winter, and I managed to have a few left by the end of summer. Suddenly I was out of them altogether, and there was no time to get back to the UK to restock, so I did the next best thing: I bought a package of 240 bags on Amazon. It came much quicker than its expected delivery date, and just in time for the chilly autumn days. Now, about that autumn: where did it go? Not that I'm complaining, but I just swapped out my closet with sweaters and now I'm frantically searching for lighter layers. Either way, I have my daily cuppa, and Tetley is it. I have PG tips waiting for you here at our apt in SA...will that do? My daily evening cuppa is rooibos, and most recently an organic Numi Rooibos Chai. PG tips is a lovely tea, Bon!